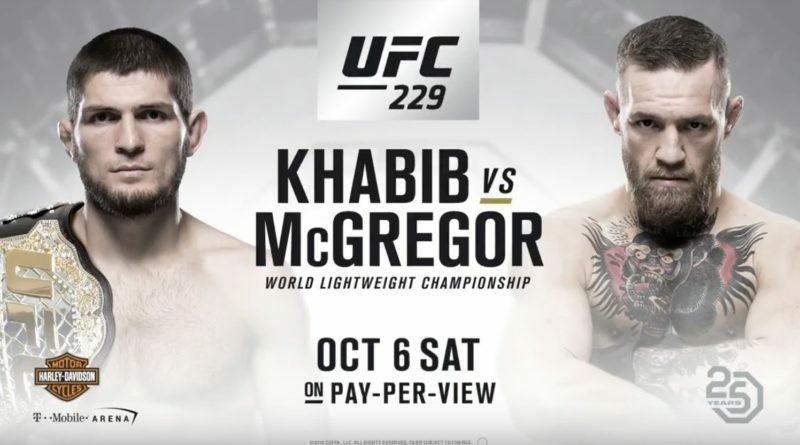 So, what went down at the end of UFC 229 was bad, real bad but let’s not forget how good of a night it was up until the end of the main event. the night was filled with exciting finishes, hilarious moments and most of all, great fights. Derrick Lewis had an amazing come from behind victory against Alexander Volkov which preceded one of the greatest post-fight interviews of all time. Tony Ferguson and Anthony Pettis went to war in what was building up to be one of the best fights the UFC has ever seen but unfortunately, Pettis broke his hand and his coach called the fight at the end of round 2. The main event lived up to the hype and went the way many critics thought, at its core, it was the classic striker vs grappler matchup but with two of the best fighters on the planet competing and the build up, it was anything but standard. Khabib controlled almost every grappling exchange, save for a couple of failed takedown attempts during rounds and had some success on his feet, catching McGregor at one point. McGregor, when he had the chance to strike caused Khabib some trouble but the high-level grappling from Khabib nullified McGregor’s attempts to get any ground in the striking. Khabib seemed to slow in the third but it almost like he was taking a round to let the body recover from 2 rounds of grappling, he didn’t seem gassed just slightly fatigued, McGregor had his best showing in this round but ultimately the grappling of Khabib had him on the mat in the fourth and in a bad position, giving Khabib the opportunity to lock in a choke. McGregor’s cardio seemed to hold up better than people expected but having someone like Khabib on you for a good portion of 4 rounds would wear anyone down. With the fight finished, The rivalry would probably continue, McGregor would asses his performance and be gracious in defeat and that would be it for the night but as soon as the fight ended, things took a turn for the worst. Khabib jumped the cage and launched himself off of the edge aiming for McGregor’s BJJ coach, Dillon Danis, in doing so started a mass brawl between camps and fans alike. Members of Khabibs team launched themselves into the cage, sucker punching McGregor, McGregor stayed mostly calm through all of this. There are reports that McGregor started it but from the footage, it looks like McGregor tries to hit one of Khabibs team members as he climbs out of the cage, but it happens after Khabib had already jumped the cage and went after McGregor’s camp so the chaos had already started. The brawl left a black mark on what was a triumphant event for the UFC, Dana White reported at the post-fight conference that it was the UFC’s second highest gate, behind UFC 205 at Madison Square Garden in New York. The arena was in chaos with fans clashing all over, Khabibs team also had 3 members arrested and later released with McGregor not placing any charges. This leaves Khabib in a tough spot, two wrongs don’t make a right, White has said that it is up to the athletic commission on what happens next for Khabib and that if it is a lengthy suspension which it most likely will be then he will be stripped of the title. This put’s the division, also in a strange spot, if Khabib is stripped, Tony Ferguson is clearly next in line for a title shot. Above him in the ranking is Mcgregor and below him is Dustin Poirier who is scheduled to fight Nate Diaz in his comeback fight, so there are a couple of matchups to make with future results pending but The money fight is Tony Vs McGregor and the statistical fight is Tony vs Poirier if Poirier beats Diaz. Who do you see the outcome of all this playing out, who is next in line for a title shot, let us know.